Otter. An exciting event when seen around our rivers, the return of the Otter to most of England is one of the major conservation success stories of the last 30 years. It is rarely observed in the wild but it is possible to detect where it has been – sites are searched for signs such as paw prints or spraint (droppings). Surveys for Otters in Barnsley have confirmed evidence of occasional Otter activity along the Dearne valley and there has also been evidence of activity on a tributary of the river Don in the west of the borough. Otter remains a Section 41 species of principal importance under NERC Act (2006). Its numbers are increasing nationally and the Otter has returned to many river catchments. It is therefore classed as Least Concern in the England Red List. However globally the Otter is classed as Near Threatened. IUCN/WCMC Red Data List. It is listed on Appendix I of CITES, Appendix III of the Bern Convention and Annexes III and IV of the EU Habitats Directive. 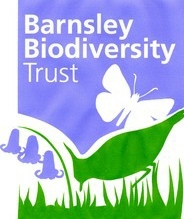 It is a local priority species for Barnsley because it remains a national priority species and there is potential for its increased presence in Barnsley. Otters have a broad, flat muzzle and a long tapering tail which is thick at the base. They have small ears and eyes on a flattish head. Their coat is mainly brown with a lighter brown bib, and spiky when wet. Otters swim very flat on the water surface and when they dive their long tail flips over and can be seen clearly. They have a high pitched squeak when calling to other otters and a loud chatter when threatening. The Otter can live for up to 10 years and produce an average of two babies per litter. Young stay with their parents for about 18 months and become fully mature in two years. Breeding sites and resting places can either be in a hole in a bank or above-ground in a flattened area of vegetation. Otters are highly territorial animals with large home ranges. Otters are opportunistic hunters that will take a wide range of prey, but mainly feed on fish. The Otter is a top predator and, as such, it occurs at a naturally low density. 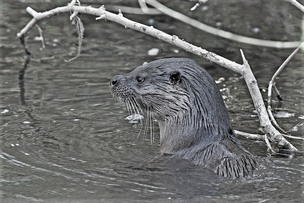 A male Otter may use up to 40km of watercourse. This would include main rivers as well as smaller tributaries, along with ponds, lakes, riverside woodland and wetlands. Otters require a plentiful food supply. Eels are often particularly favoured. Amphibians and Crayfish may be locally or seasonally important, and small mammals and birds are occasionally taken. Information on the distribution of Otter in Barnsley, its conservation and proposed actions can be found via the links below. 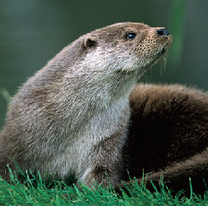 The Otter is a large member of the stoat and weasel family that frequents rivers, streams, lakes and marshes. It is easily distinguished from the smaller Mink, giving a general impression of being dog-sized whilst Mink are at most cat-sized.